South India Adventure Tour - Backwater Of Kerala:. Received at the airport and transfer to the hotel. 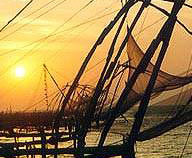 Afterwards sightseeing tour of Cochin takes you around to Jewish Synagogue, Spice Lane, Antique Lane, and Dutch Palace. In the evening witness Kathkali dance, a classical form of Kerala which follows the age old tradition of dance drama. Couple of hours away is Munnar, a hill station on the Western Ghats has lakes, reservoir�s, forests and tea estates. Look around the hill station on foot. Overnight at the hotel. 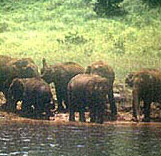 Enjoy a relaxing breakfast and then drive down to Periyar, the wildlife sanctuary famous for it's large elephant population, which can be easily, be spotted from the boat. Overnight at the resort. Early morning enjoy boat cruise on the Periyar Lake, which is surrounded by forests meadows and hills. One can sight wildlife like elephants, woodland birds, darters and cormorants. Overnight at the resort. Depart for Kumarakom. Also, enjoy backwater cruise at Vembanad Lake and check-in into hotel for overnight stay. Kumarakom lies on the Eastern Shore of the Vembanad Lake and convenient point to check out a bird sanctuary which is just across the lake. Drive down later to Kovalam and overnight at Beach Resort. Drive down to Trivandrum to catch a flight for onward destination.